For today’s MFT security tip, let’s talk about replacing default admin passwords. Most software applications come with default admin passwords. You normally use it to gain initial access to the application right after installation. The problem with these default passwords is that, some of them are well known, that they often find their way into hacking forums in the dark web. And so, if cyber crooks get hold of the factory default administrative password of your server application, all they’ll need to do is drop by your application’s front door and just enter those default login credentials. A lot of applications and even network devices have already been compromised simply because their default passwords remained unchanged. To prevent this from happening to your system, you need to immediately replace default passwords as soon as you’re done installing an application. Now, JSCAPE MFT Server doesn’t come with any default login credentials. However, if you simply followed the installation instructions in the documentation, there’s a chance you might have just copied the sample login credentials given there. So, assuming that’s what you did, you need to replace those administrative login credentials. 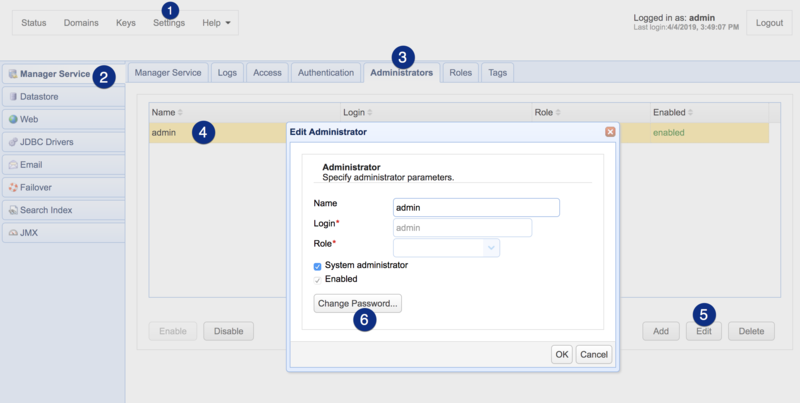 To do that, just go to Settings > Manager Service > Administrators > select the administrator account and click Edit. You can then change the password from there.